This week we’ll take a look at the oldest Formula One team on the grid. Ferrari was racing in Formula One before Formula One was invented! They are the only team to have raced in every season of the Championship, they missed the opening round (the 1950 British Grand Prix) but showed up at the Monaco Grand Prix (what a GP to debut with!) with Alberto Ascari and Gigi Villoresi. Free! Eternal Summer Episode 1 : Stormy Dive-Dash! We are back with the boys (and to be fair girls!) of the Iwatobi High School Swimming Club! What adventures await us? Who knows. The second series of the hit Swimming anime is upon us. So Free! Eternal Summer has started this week and I thought I’d share my opinion on the first season first before starting my review on the second over here. We have decided to have a book club. We will post the book at the beginning of every month and then post our reviews/chatter on it at the end of the month. 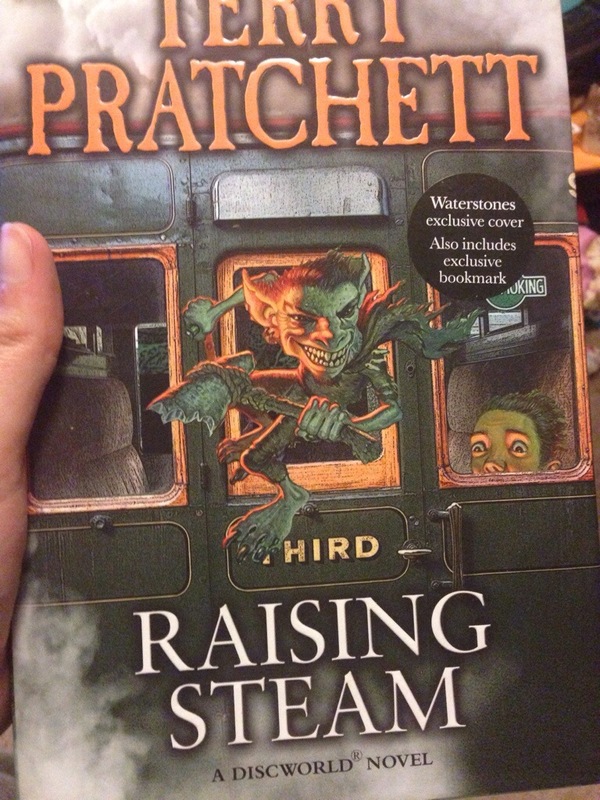 Raising Steam by Terry Pratchett. So yes I am planning on watching Formula E, no I don’t care about what a lot of people are saying about it, for me it is just another racing series and it just so happens to have a lot of drivers I have supported over the years racing in it! Today we had the first testing session. Results below the cut! Also below the cut is the dates of the races, for us here in the UK it is being shown on ITV4. I’m really looking forward to the series, honestly I am! There are some really strong drivers in the field from Bruno Senna and Lucas di Grassi to Sam Bird and Nico Prost. And the ever bearded these days Nick Heidfeld. The cars look great and the series looks like it will be every bit as competitive as any other series, I am really looking forward to it and it’ll become part of the big F1 dream series. Mainly because it gives my alter ego a chance to go on and on and on about Bruno Senna and Nico Prost forever more! So who else is going to be keeping up to date with Formula E? Any feelings on the subject? Silverstone pretty much splits the season in half, along with the Italian Grand Prix it is the oldest continuously staged Formula One race, even if it hasn’t always been at Silverstone. But Silverstone is where the action takes place now. And don’t we all love Silverstone? Sherlock coming back with a new series AND a special! So at 2.21pm today the BBCOne twitter fed who had been teasing us all night with the hashtag #221back announced the recording plans for Series 4 of Sherlock….. The Special will begin filming in January with the three episodes of Series 4 being filmed later in the year. We have been promised the biggest mystery yet. The game is truly afoot and we should all carry on expecting the unexpected!